Genomic pipelines consist of several pieces of third party software and, because of their experimental nature, frequent changes and updates are commonly necessary thus raising serious deployment and reproducibility issues. Docker containers are emerging as a possible solution for many of these problems, as they allow the packaging of pipelines in an isolated and self-contained manner. This makes it easy to distribute and execute pipelines in a portable manner across a wide range of computing platforms. Thus, the question that arises is to what extent the use of Docker containers might affect the performance of these pipelines. 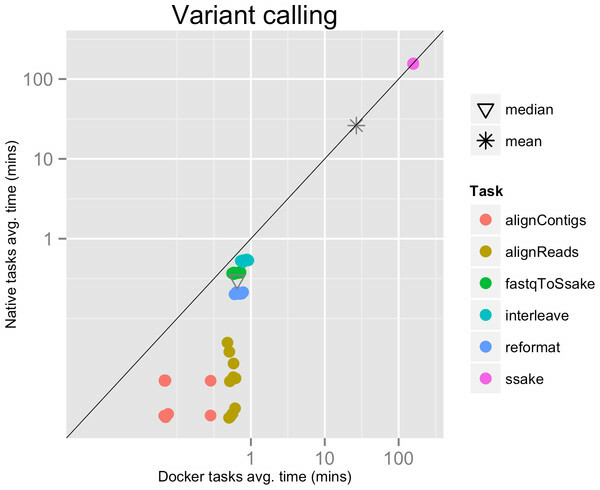 Here we address this question and conclude that Docker containers have only a minor impact on the performance of common genomic pipelines, which is negligible when the executed jobs are long in terms of computational time.